(Online tutoring: £18) (Normal tutoring £22) Hi there! I’m Tahmina and I am currently a chemistry student at Queen Mary University studying for a Bsc Degree. I was a maths tutor for 2 years teaching KS3-GCSE level maths to a small group of students. 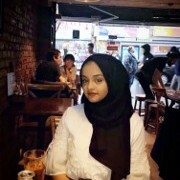 I am also a student ambassador at my university and enjoy tasks that involve communication and socialising as I am a very friendly and bubbly individual. What makes me a good tutor is the patience and encouragement I can provide to potential students. I believe getting better at a subject requires developing good studying habits as well as being strong on content. I thoroughly enjoy maths and aim to radiate my passion to future students. In my spare time I like to travel around London, as well as spending time with friends and family. I was a maths tutor at kumon for 2 years. This meant that I used teach KS3-GCSE level students. I mainly tutored in small groups, which meant that I gained experience in tutoring multiple students at a time whilst also highlighting the strengths and weaknesses of each student. My method of teaching focused on building strong foundations for students in order to help students develop good habits in studying to help them when they go on to study independently. Moreover, I did 1-1 maths tuition at my secondary school for students in lower years, usually during my spare time as a voluntary extra curricular activity. By far the best tutor I have had for my children! Very enjoyable and good quality lessons! Very professional.